Tableau is an interactive data visualisation products focused on business intelligence. 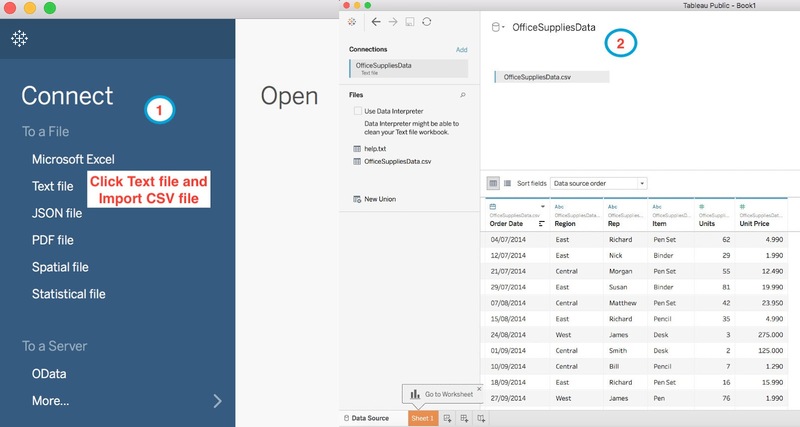 It provides support for integrating various data source like CSV, databases(local and cloud), various big data storage like Apache drill, Hive, etc. It query datasources and then generates a number of graph types and store and retrieve data from its in-memory data engine. 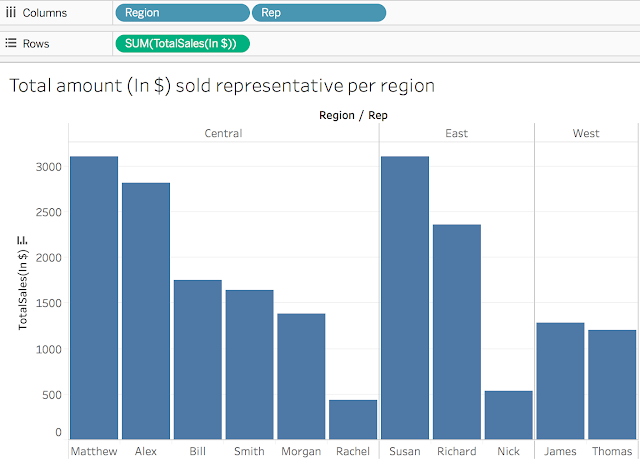 In previous posts we saw how to integrate tableau with Hive and visualise & Integrate Tableau and Apache drill(JSON data source). Here we will use CSV data source to visualise using Tableau. 2. Click Text file form connect section and import CSV file & visualise CSV data in tabular form. Click on Sheet 1 and open dashboard. Under data tab we have two sections (Dimension and Measures) which contains columns from data source. 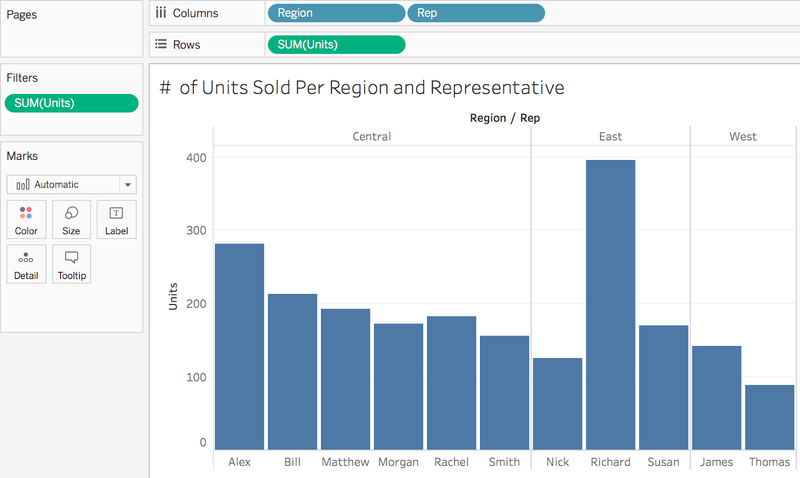 Drag and drop Region & Rep from dimension to working area, which acts columns data. Similarly drag and drop Units from Measures in working area. Alex sold maximum units in Central, Richard in East and James in west region. Does any company interested in number of units sold by their representative or total amount in $. Lets create new field Total from dependent fields (Units and Unit price). Do right click in Measures section and select "Create Calculated field". Using Units and unit price compute TotalSales which listed in Measures section. Delete Sun(Units) from Rows. Drag & drop TotalSales instead. Now we have a chart with Rep with TotalSales(In $). Above chart shows Matthew is best Rep in Central, Susan in East and James in West region. TotalSales(In $) gives right insights about sells and representative. 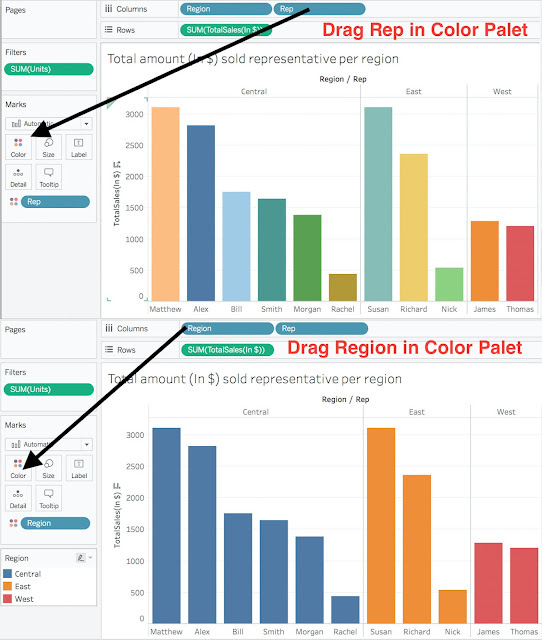 Colourful chart: Drag and drop Region & Rep in Color pallet. It modifies chart and each bar is coloured. If Rep is dragged- each rep is f different color, when Region is dragged - each region is represented with different color. 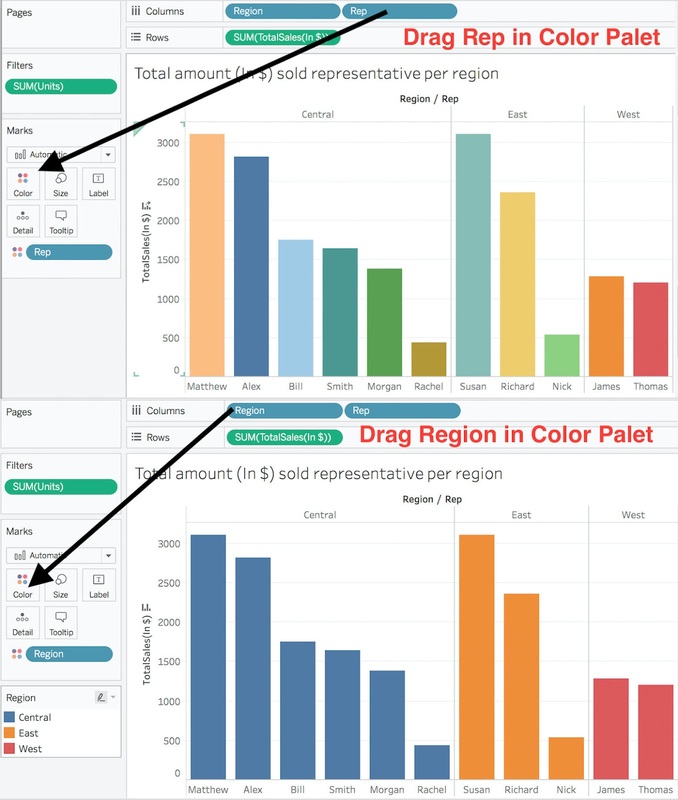 Format Labels: Drag TotoalSales in Label pallet (beside Color). It brings total sales value on each bar of chart. Format of currency representation can be changed. Try Yourself: Modify existing worksheet and compute bonus for each Rep as 5% of individual's TotalSell and display at top of each Rep.